Santika Indonesia Hotels and Resorts opened Amaris Hotel Embong Malang, Surabaya on October 11, 2012. This hotel is the 22nd Amaris Hotel to be built as well as the group’s 51st property in Indonesia. In building the first Amaris Hotel in Surabaya, Santika Indonesia Hotels and Resorts partnered with local investor PT Victoria Mitra Abadi, which also built Hotel Amaris Ambon. Located at Jl. Kedung Doro no 1-3, Amaris Hotel Embong Malang, Surabaya is in the neighborhood of Tunjungan Plaza, the city’s biggest and most popular shopping center. Its strategic location enables our guests to conveniently reach the heart of Surabaya’s business district. Surabaya is considered an important city for business because many regard this second biggest city in Indonesia as the port to Eastern Indonesia cities. Surabaya is also home to many headquarters of big companies, making it an important hub for business and economy. With increasing demand in accommodation for business and MICE in Surabaya and East Java in general, hotels and restaurants are flourishing in this city for the past years. According to Indonesian Hotel and Restaurant Association (PHRI), the last three months witness a raise in room occupancy at hotels in Surabaya, when meetings and year-end activities resumes after Lebaran break. Indeed, the coastal capital of East Java is often dubbed as the city that never sleeps. Targeting businesspeople, Hotel Manager Amaris Embong Malang, I Nyoman Setiawan, is positive about the hotel occupancy rate. Identified as smart and trendy hotel, Amaris is dedicated to provide easy and comfortable stay for all guests. The smart model includes locations, services and employees. With a modern concept, this property features minimalistic design with vibrant color scheme. The other Amaris hotels in Indonesia spread in major cities such as Ambon, Cirebon, Bogor, Jakarta, Palangkaraya, Makasar, Pekanbaru, Banjarmasin, Bandung, Bali, Semarang and Jogjakarta. 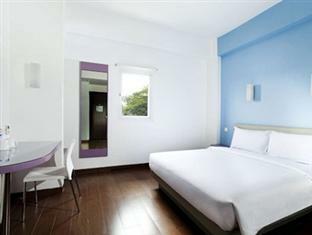 Amaris Hotel Embong Malang, Surabaya has 105 smart and superior rooms, with simple, clean and modern design. Each room’s amenities include LED TV and safe deposit box. Easily accessible internet is also available during the stay. Everything is designed to fulfill professional’s dynamic need and to cater to travelers with straightforward needs and uncomplicated amenities. Santika Indonesia Hotels & Resorts manage four-star properties which are listed as Hotel Santika Premiere and three-star business hotels listed as Hotel Santika. The group currently develops the Amaris brand which caters to a wider client base, from two star budget hotels to luxurious villa properties. They also develop brand of unique boutique villa properties listed as The Royal Collection under the property names of The Samaya and The Kayana. This year, Santika Indonesia Hotels and Resorts is planning to expand its properties, adding 25 more in the near future. The plan includes another Amaris hotel in Surabaya and Amaris Hotels in Malang and Singapore. This advertorial was published in the Jakarta Globe on October 17, 2012.